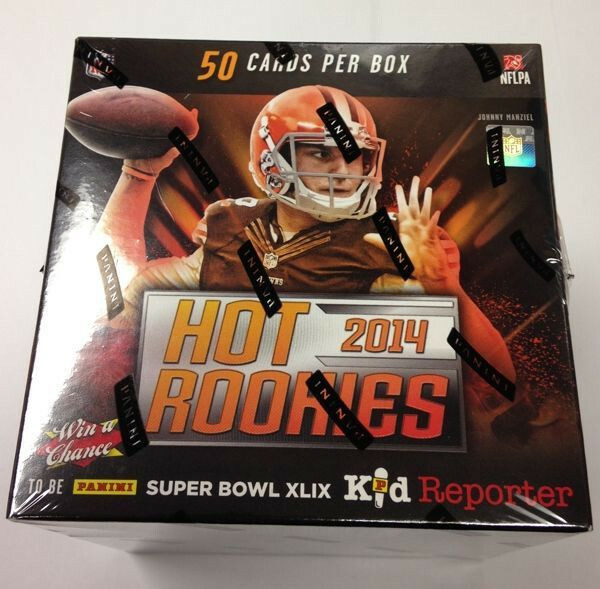 Factory Sealed 2014 Panini Hot Rookies Football Hobby Box mit 4 Packs a 50 Cards per Box. 3 Autogramme, 1 Autogramm-Memorabilia Card, 4 Insert Cards und 10 Rookie Cards per Box ! Produktinformationen "2014 Panini Hot Rookies Football Hobby Box NFL"
Factory Sealed 2014 Panini Hot Rookies Football Hobby Box mit 4 Packs a 50 Cards per Box. 3 Autogramme, 1 Autogramm-Memorabilia Card, 4 Insert Cards und 10 Rookie Cards per Box ! Packs in Pack #1 - All 32 Base Cards in each hot pack are numbered to 99 or less! Found in every Pack #4. Found in every pack #3. Weiterführende Links zu "2014 Panini Hot Rookies Football Hobby Box NFL"
Fanbewertungen für "2014 Panini Hot Rookies Football Hobby Box NFL"